Fireplaces — Smith & May Inc. If you already know what kind of fireplace you are looking for, use the menu on the left of the page to find it. If you're not sure, a terrific collection of information on hearths, benefits of different fuel choices, and general safety is available on the Hearth, Patio, and Barbecue web site. As always, our showroom staff is more than happy to answer any questions. You can reach us by phone Monday through Saturday during regular business hours. So you want the look and feel of a glowing hearth, but without the preperation and clean-up of a woodburning fireplace. A gas fireplace might be exactly what you're looking for. For some helpful tips on gas fireplaces, venting systems and more, please visit our hearth planning page. Call us any time during business hours and we'll be happy to help you choose the right fireplace for your home. Styled for contemporary environments, the Regency Horizon HZ965E features an inset design that allows finish materials to be installed right up the fireplace's edges for a clean look with one of the largest viewing areas offered. The Liberty L965E has one of the largest viewing areas available in the Regency line and permits finish materials to be installed to the edges for a pure, unadorned appearance. Excellent for larger living space. Breathtaking View! The pier design allows you to enjoy warmth & beauty from all three sides of the P131. Use this fireplace as a subtle room divider or bring two rooms together with the shared view. The HZ40E is only one example of this contemporary line. You can add a tasteful surround in a variety of modern finishes or enjoy a clean finish with no louvers or faceplates. One of the most popular uses for the Regency Horizon See Through is to create two amazing fire views from separate rooms using one fireplace. It is a cost effective way to divide a larger space while maintaining an open feel. The flush-fit design of the Regency Bellavista™ B36XTCE gas fireplace permits surround finish materials to be installed right to edges for a clean, unadorned appearance. True flush finishing and a louverless front face provide an unobstructed view of the fire in Regency’s new Panorama™ P33CE gas fireplace. A true focal point in small to medium-sized spaces. 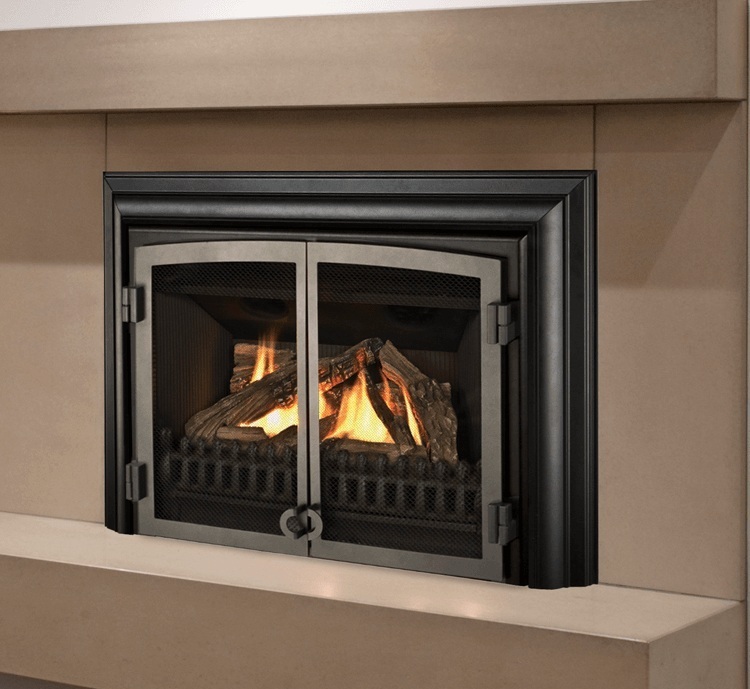 Whether you’re looking for sleek materials, such as brushed stainless, or a unique multi-sided unit for that special room, European Home offers a complete line of direct vent and vent-free indoor and outdoor gas fireplaces. The Horizon Series has proven itself as a tried and true heater, warming thousands of homes across North America for almost two decades. The unique Fenderfire screen fronts create the asthetic of a wood-burning fireplace while providing all of the advantages of advanced direct vent technology. The Victorian castings of the he Windsor Arch combines modern technology with a subtle hint of distinction and elegance from a time once forgotten. The L2 is luxury fireplace design at its finest. Inspired by the highly successful L1 series, the L2 boasts an impressive 50” linear viewing area that highlights magnificent flames within. The perfect blend of radiant and convective heat provides efficient, steady warmth for the largest of spaces. Spectacular flames accompany clean, simple design elements. Available in black, brushed nickel and artisan patina, the Ledge is our latest addition to the Portrait Series gas fireplace family. With minimal impact on actual floor space, it is ideal for small spaces. FireStones for those with contemporary decor, for those with a modern flair, for those yearning for an alternative to the ubiquitous gas log and for those who just want something different. ORTAL boasts more than 60 models, the largest selection of modern fireplaces in North America. They’re available in an impressive array of sizes to suit design and architectural needs. Available in matte black, 10 decorator colors fired in porcelain, and satin brass. The versatility of the Gas Carousel is unlimited, center of the room, in the corner, or near a straight wall with only 6" clearance from combustible materials. Heat & Glo's Carolina is anindoor/outdoor see-thru fireplace. Enjoy your fireplace from your family room and patio simultaneously, any time of the year. This 36" open-hearth gas fireplace gets homeowners as close as possible to the experience of a woodburning fire. It also offers a number of benefits that make it a strong all-around choice. It can burn with the optional doors open or closed. When you look through the large glass window of the caldera you see dancing flames and beautiful glowing logs. Trends may come and go, but the classic design of the DXV Series fireplace is a timeless addition to any home. Five models, three award-winning log sets, and literally hundreds of combinations of fronts, doors, finishes and other options. Perfectly proportioned for larger rooms, the FV46 FullView fireplace impresses without overpowering. Beneath its charming exterior, the Chelsea is an 27,000 to 6,750 BTU high efficiency wall furnace that will provide plenty of adjustable warmth to any room. SPARK’s clean, updated aesthetic is matched only by its level of practical versatility. Most can be paired with a customizable surround in varying dimensions, details, and styles - extremely energy-efficient. There's just nothing like coming home to the warmth and smell of a wood fireplace. At Smith & May we carry a range of traditional and contemporary takes on this age old heating method. Call us any time during business hours for assistance in choosing the right fireplace for your home. The FP30 Arch meets the need for high-capacity wood heat, with the space savings and convenience of a wall-mounted fireplace. The sleek, finely finished styling has come a long way from grandma's old black wood fireplace. The Excalibur Wood Fireplace has been tested to the toughest standards established by the EPA. The Focus is a truly amazing fireplace. The compact body makes it versatile enough to use as a replacement for an existing fireplace, but the glass viewing space has been maximized. It is also ideal for installations where a raised hearth is desired. This award winning, open hearth design offers major advantages over a traditional fireplace. The hideaway guillotine door allows you to enjoy your fireplace with the door open or closed. The door disappears without altering your view of the flames. The Birmingham masonry-style woodburning fireplace offers a masonry fireplace appearance at a fraction of the cost of a site-built masonry fireplace. The Birmingham is designed with molded brick panels in traditional or herringbone brick that reflect a true firebrick color and size. With its unique refractory lining color and texture, Icon is a timeless, dramatic fireplace. Icon's opening height measures at twenty-eight inches and has a true brick to brick opening width of forty-two inches. View more sizes on Heatilator's website. The Galaxy is one of the largest non-catalytic EPA approved zero clearance fireplace capable of heating up to 2,500 square feet. Features include a unique door operation, a removable ash lip, and for your cooking pleasure...a built in BBQ grill. With the door lifted, you enjoy the warmth of a genuine open fire. With the door closed, you get a full view through the panoramic window and with the maximum efficiency. The tall arched opening of the 7100 provides a beautiful view of the four-point combustion technology burn. With the capability to add up to two remote Heat Zone systems, the 7100 allows for heat distribution throughout the home. Decorative firescreen and trim options are available. A totally new way of enjoying the atmosphere and magic that only a real fire can create - at the press of a button! Call us any time during business hours and we'll be happy to help you choose the right elecric fireplace for your intended location. The Celsi represents a combination of style and innovation to bring you this range of ultimate electric fires with the most convincing real fire effect on the market today. The Nicole Wall-mount Fireplace provides a modern touch to any decor. Either hung on a wall, or standing on a table, flames that dance amongst the diamond-like acrylic ice ember bed, sparkling in up to 7 different colorful themes. The tempered glass front and a seamless black finish design of the Convex wall mount fireplace, combine to create a contemporary look that adds style to any décor. Choose surface-mount, plug-in installation for the ultimate simplicity or recessed installation & hardwired capabilities for a sleek low-profile look. Rustic meets chic with the Chalet wall-mount fireplace. This unit offers a new drift wood and river rock interior . The unique look is continued with two strong mocha-coloured horizontal components and high polished black metal end caps. Featuring Skope’s powerful Chromalight Immersive LED technology, assortment of feature fuel effects, and advanced remote you can control the look from anywhere in the room. Fireplace inserts are designed to enhance the operation and appearance of an existing wood burning fireplace, whether masonry or factory-built. Categorized primarily by the fuel burned for operation (natural gas, propane, EPA-certified wood, pellet and coal), a fireplace insert is installed into an existing wood burning fireplace. • Gas Inserts - Natural gas and propane (otherwise known as LP or “liquefied petroleum gas”) are the two types of gas used in hearth products, and are fossil fuels. • Wood Inserts - Wood is a renewable, non-fossil fuel is abundant throughout North America. • Pellet Inserts - Pellets are a renewable, non-fossil fuel made from 100 percent compressed sawdust. This fuel was developed in the 1970s as a way to use the waste wood from manufacturing processes. New England Wood Pellets and Maine Woods Pellets are available from Smith & May. More information on request. Call us any time during business hours or stop into our showroom to view our working displays and we will be happy to help you choose the right fireplace insert for your home. Conventional log sets and brick linings give way to contemporary elements in FullView Modern inserts. As one of the first to bring to market a linear designed fireplace, Montigo now offers the largest selection of linear fireplaces. Introducing the Legend G4 Insert, our latest addition to the Valor insert family. Considered the "big brother" to our highly successful Legend G3 Insert, the G4 is a synthesis of distinct design and efficient, radiant heating performance. Programmable remote™ system Modulating fire turns down an incredible 73% for steady even heat. Heats without electricity - operates during a power outage. Primary and secondary heat exchangers - heats without the need for a fan. The President Zero Clearance is ideal for building into those smaller intimate spaces, requiring only 11" depth and 26" width. The Classic Wood Insert can burn up to 10 hours with one load of wood. It also boasts an improved airwash system to keep the glass door cleaner longer for a better view of the fire. This Hampton cast wood insert installs easily into your existing fireplace adding the timeless beauty of cast iron while eliminating drafts from an open fireplace. This fireplace insert can deliver up to 55,000 BTUs. The Alterra contemporary wood insert features a sleek, modern front that transform your fireplace opening into a style savvy, effcient heater. Available in 2 sizes &includes a two-speed blower, helping distribute the heat to the far corners of your living space. The Pacific Insert, with its large, ceramic glass door gives you the full comfort and view of your log fire. Transform your drafty fireplace in an easy-to-light, easy-to-load reliable source of heat with the convenience of one-touch adjustable temperature control. The H530 is simple and stylish. It is easy to install and transforms an inefficient existing fireplace into a warm, inviting, radiant heat source. This results in greater efficiency and control with reduced fuel consumption. 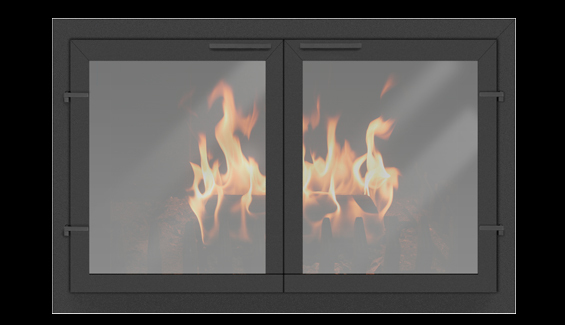 The Optifire fireplace inserts are as beautiful as they are powerful…heating up to 50,000 BTUs. They can either be installed into an existing masonry fireplace or incorporated into new construction. Available either with a sleek “flat screen” door or a convex style curved door. 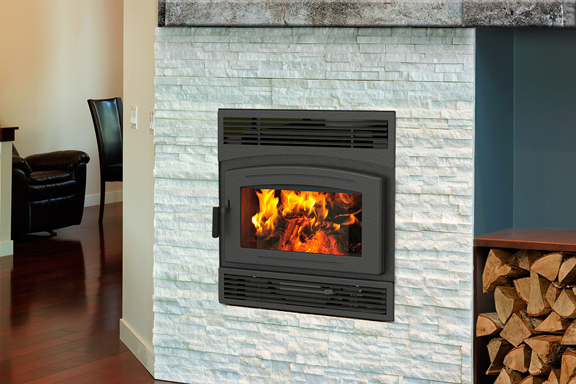 The 2700i ACC fireplace insert is a big performer created for small fireplaces. The compact shape is specially designed to transform today’s factory-built fireplaces into high efficiency heat sources. The simple design and flush front complement a wide range of decorating styles. The 4100i fireplace insert features the tradition and charm of cast iron design. The distinctive full bay door with three glass panes offers remarkable views of the patented four point combustion technology burn. The Voyageur cast wood insert is the first flush hearth wood insert offered by Quadra-Fire, combining the famous Quad burn with a powerful performance. Featuring a flush front with elegant lines, the fire is enjoyed through the large, unobstructed viewing area. Recognized as one of the largest inserts in the industry, the Volcano Plus can heat vast areas of your home even without the use of its blowers during the coldest winter days. The Mt. Vernon Insert burns a wide variety of biofuels, including wood pellets in various grades, 100% corn, sunflower seeds, and wheat. You simply choose the most economical source for your area. The Mt. Vernon Insert makes all the adjustments for the best burn possible. The Santa Fe Pellet Insert offers the first performance-inspired, sleek, contemporary design in a pellet insert. It’s the perfect solution for busy people who enjoy the beauty of fire, but also want a clean-burning, renewable fuel heat source. Choosing a glass door for your fireplace is like buying a piece of furniture, your fireplace is the focal point of your home, and with the options we have to offer, you can create a door that adds efficiancy and also compliments your home. Portland Williamette offers a wide variety of fireplace doors, all made in the USA. Choosing your new fireplace mantel, surround or cabinet combination is easier than you think. We offers a wide variety of sizes and styles of fireplace mantles, from something for the budget-minded, do-it-your-selfer to sophisticatedly elegant. The hard part may be narrowing down your options. Call us if you'd like some assistance. Personalize your fireplace with a mantel and surround. Our options include wood fireplace mantels that range from classic to contemporary designs. Through our enthusiastic use of stone, wood and iron, we have created a range of products that compliment the respected line of Valor gas fires. The ambiance of a flickering fire in the fireplace can take the edge off a hectic day and soothe away stress. For those with limited time or energy, building a welcoming fire isn’t always a simple task. But there is a solution. Install a set of gas logs into the fireplace and enjoy a fire in seconds, whether for an hour or the entire evening. Stop by our West Rockport showroom to view a gas logs display. 8-log set 5/8" thick grate Large amounts of embers Black rock standard Split top logs with Bonfire style bottom logs Special two-piece rotten front log for maximum ember effect. A good look at a great value! Eight richly-detailed logs. Works with three types of burners, Safety Pilot and Remote Ready. Hearth kit/burner sold separately. Realistically-detailed logs with the appeal of a fully charred, mature fire.Remote Ready. Hearth kit/burner sold separately. “Evening” Series Charred-through front logs allow more flame viewing. “Traditional” Series Solid front logs with a traditional look. Rasmussen has designed gas log sets specifically for use in Rumford Fireplaces. The layout of these efficient fireplaces is not well suited for standard gas log sets. Hearth products are vented in three ways: natural draft (vented through the roof), direct-vent, and vent-free. 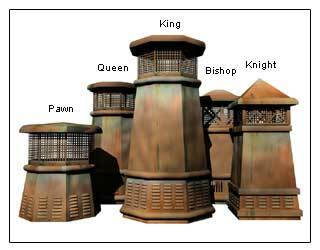 Below are the options for gas hearth appliances. Unvented and vent-free refers to the kind of hearth appliance that draws its combustion air from inside the home. Caution should be used in choosing a vent free fire place. Moisture content and other products of combustion can cause adverse effects on wall and ceiling finishes. Persons with respiratory problems and allergiess should avoid vent free appliances. Wood burning fireplaces are naturally vented 3 feet above the roof of the house or a minimum of 2 feet above any point of the structure within a ten foot radius. Depending on the fireplace selected , this venting can occur through a masonry or stainless steel , Class A type all-fuel chimney system. Fireplace inserts must be installed into and existing masonry fireplace or approved metal enclosure. Fireplace inserts are either vented naturally through a working chimney, direct vented or vent-free depending on fuel choice. In all cases, a chimney liner is required. The type and size of the liner is specific to the fuel and fireplace type. For gas fireplace inserts we stock high grade flexible aluminum liners and related termination components. For wood burning fireplace inserts we stock stainless steel chimney liners, insulation and termination components.